A dear friend and I have some running jokes about Narwhal. (Don't ask.) So when I found this photo in a wildlife photography book, I knew I had to make him an envelope. I highlighted the tusk tips with Stickles glitter glue, and used a sea critter stamp to continue the theme. 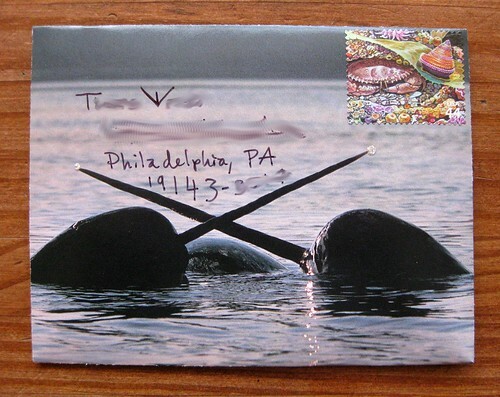 Narwhal are real, of course, but I thought a unicorn and a mermaid would be good company. Ok, I won't ask, even though I really want to. 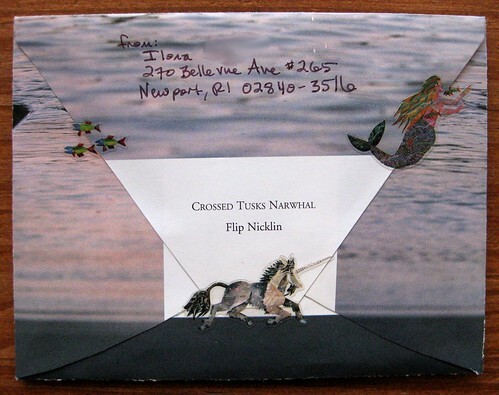 Creative and clever envelope, as always. I love the mermaid stamp as well . I love running jokes as well . gotta love the narwahls huh ?